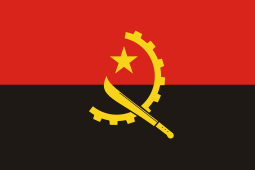 The People's Armed Forces of Liberation of Angola (Portuguese: Forças Armadas Populares de Libertação de Angola) or FAPLA was originally the armed wing of the People's Movement for the Liberation of Angola (MPLA) but later (1975–1991) became Angola's official armed forces when the MPLA took control of the government. After the Bicesse Accords in 1993, the FAPLA were transformed in the Angolan Armed Forces (Forças Armadas de Angola) or FAA, by the integration of the members of the Armed Forces of Liberation of Angola or FALA, which constituted the former armed wing of UNITA. In the early 1960s the MPLA named its guerrilla forces the "People's Army for the Liberation of Angola" (Exército Popular de Libertação de Angola - EPLA). Many of its first cadres had received training in Morocco and Algeria. In January 1963, in one of its early operations, the EPLA attacked a Portuguese military post in Cabinda, killing a number of troops. During the mid-1960s and early 1970s, the EPLA operated very successfully from bases in Zambia against the Portuguese in eastern Angola. 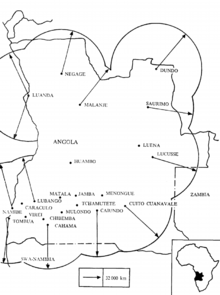 After 1972, however, the EPLA's effectiveness declined following several Portuguese victories, disputes with National Liberation Front of Angola (FNLA) forces, and the movement of about 800 guerrillas from Zambia to the Republic of Congo. On August 1, 1974 a few months after a military coup d'état had overthrown the Lisbon regime and proclaimed its intention of granting independence to Angola, the MPLA announced the formation of FAPLA, which replaced the EPLA. James writes that in 1974-75, '..after a period of six months, Moscow started to arm Neto's faction exclusively. The Soviet Union supplied the MPLA with $300 million worth of materiel as compared to $54 million over the previous fourteen years. The weapons that went to MPLA included AK-47 assault rifles, 120-mm mortars, 82-mm and 107-mm recoilless rifles, 37-mm and 14.5 mm antiaircraft guns..' and T-34, T-54, and PT-76 tanks. Independence was set for November 11, 1975. By 1976 FAPLA had been transformed from lightly armed guerrilla units into a national army capable of sustained field operations. This transformation was gradual until the Soviet-Cuban intervention and ensuing National Union for the Total Independence of Angola (UNITA) insurgency, when the sudden and large-scale inflow of heavy weapons and accompanying technicians and advisers quickened the pace of institutional change. Beginning in 1978, periodic South African incursions into southern Angola, coupled with UNITA's northward expansion in the east, forced the Angolan government to increase expenditures on Soviet military aid. Dependence also increased on military personnel from the Soviet Union, the German Democratic Republic (East Germany), and Cuba. Unlike African states that acceded to independence by an orderly and peaceful process of institutional transfer, Angola inherited a disintegrating colonial state whose army was in retreat. The confluence of civil war, foreign intervention, and large-scale insurgency made Angola's experience unique. After independence, FAPLA had to reorganize for conventional war and counterinsurgency simultaneously and immediately to continue the new war with South Africa and UNITA. Ironically, a guerrilla army that conducted a successful insurgency for more than a decade came to endure the same kind of exhausting struggle for a similar period. Line up of decommissioned FAPLA combat vehicles in the South African National Museum of Military History: Ural-4320, PT-76, and T-34-85 tank. The Library of Congress Country Studies said in c.1988 that 'FAPLA's military performance is difficult to gauge, particularly in view of the propagandistic reports issued by the various forces that contended in the region.' On the one hand, UNITA had extended its range of operations from the remote south-eastern extremities throughout the entire country within a few years of Portugal's withdrawal. The South African Defence Force (SADF) had occupied parts of southern Angola for extended periods, virtually without contest, for the purposes of resupplying UNITA, intervening on its behalf, conducting reconnaissance flights and patrols, and attacking South-West Africa People's Organisation encampments. UNITA reported low morale among captured FAPLA conscripts, lack of discipline among troops, heavy losses of personnel and equipment in battle, countless ambushes and attacks on FAPLA forces, successful sabotage operations, and desertions by battalion-size FAPLA units. In the late 1980s, Angola's minister of defence publicly called for greater discipline in FAPLA, citing reports of theft, assaults, and drunken military drivers. As late as 1988, in the wake of reports of increased Angolan Air Force effectiveness, the South African Air Force commander dismissed the Angolans as "extremely unprofessional," noting that "50 percent of the threat against us is Cuban." FAPLA's air defence network in 1987. On the other hand, it could be argued that FAPLA had substantially improved its capabilities and performance. In the first place, FAPLA had begun to develop and acquire the organisation, doctrine, and equipment of a conventional army only during the civil war of 1975-76. It was then forced to fight a counterinsurgency war in the most remote and inaccessible parts of the country over extended lines of communications, without the requisite air or ground transport or logistical infrastructure. UNITA also enjoyed the advantages of operating in thinly populated areas along porous borders with Zambia and Zaire, with extensive SADF combat and logistic support, making it impossible for FAPLA to isolate or outflank UNITA. Moreover, military experts believe that counterinsurgency troops must outnumber guerrillas by ten to one in order to win such wars, a ratio FAPLA could never approximate. The air force and navy were even further behind and had required years to acquire the assets and the expertise needed for effective operations. Although the navy was of marginal use in the war, air power was critical. It was only after sufficient aircraft and air defence systems had been deployed in the mid-1980s that Luanda was able to launch and sustain large offensives in the south. In August 1986, FAPLA repelled UNITA after they had captured Cuito Cuanavale during Operation Alpha Centauri. Although they suffered heavy losses and perhaps relied too heavily on Soviet military doctrine, the FAPLA and the Angolan Air Force (FAPA/DAA) in the late 1980s showed increased strength, put greater pressure on UNITA, and raised the costs of South Africa's support for UNITA. Luanda's resolve and the improved capabilities and performance of its armed forces were among the essential conditions under which South Africa agreed to negotiate its withdrawal from Angola. Howe writes that Angola's defence minister acknowledged that senior officials profited significantly from weapons purchases; a newspaper sympathetic to the MPLA, Angolense reported that senior officers made US$320 million in commissions. Following the peace agreement with UNITA prior to the 1992 elections, the two armies of FAPLA and UNITA commenced integration. Although the integration was never completed as UNITA returned to war following their loss of the elections, the army was renamed the Angolan Armed Forces (Portuguese: Forças Armadas Angolanas (FAA)), losing the close nominal association with the MPLA. Before 1988 FAPLA's areas of operations were divided into ten military regions. The First Military Region comprised the Zaire and Uíge Provinces, while the Second comprised the Cabinda enclave. The Fifth and Sixth Military Regions faced Namibia in the south. In early 1988, however, calling this structure inadequate, the Ministry of Defence announced the formation of northern, eastern, southern, and central fronts. The northern front encompassed Zaire, Uíge, Malanje, Cuanza Norte, and Bengo provinces. The eastern front covered Lunda Norte, Lunda Sul, and Moxico provinces. No official information on the other fronts was available in late 1988, but presumably the southern front included Cuando Cubango, Huíla, and Namibe provinces, and the central front may have comprised Bié, Huambo, Benguela, and Cuanza Sul provinces. There was no information on the status of Cabinda and Luanda provinces, but perhaps they remained separate regions because of their strategic importance and small size. Because of the uncertain boundaries of these fronts, most news accounts referred to the military regions when describing FAPLA's areas of operation. As of late 1988, Lieutenant General António dos Santos Franca(nom de guerre Ndalu) was FAPLA chief of the general staff and army commander. He had held these positions since 1982. 1 2 3 4 Collelo, Thomas. Angola, a country study. Vol. 550, no. 59. Government Printing Office, 1991. ↑ W. Martin James III, A Political History of the Civil War in Angola 1974-90,' 'New material in this edition 2011,' Transaction Publishers, original edition 1992, 54. ↑ Howe, Herbert M. (2005). Ambiguous Order: Military Forces In African States. Boulder, CO., and London: Lynne Rienner. p. 91. ISBN 1-58826-315-0. citing 'Profits Fuel Angola's War,' Guardian Weekly, 8-14 July 1999. ↑ See also Defense Intelligence Agency, Military Intelligence Summary - Africa South of the Sahara, DDB 2680-104-85, ICOD 15 October 1984, Angola p9-10, declassified by letter dated April 29, 2014. ↑ dos Santos Franca later became Minister of Defence, first Angolan Ambassador to the United States 1995, and nonexecutive chair of De Beers Angola, 2005. Polack, The Last Hot Battle of the Cold War: South Africa vs. Cuba in the Angolan Civil War, Casemate Publishers, 2013, 201. Edward George, The Cuban Intervention in Angola, 1965-1991: From Che Guevara to Cuito Cuanavale. Psychology Press, 2004. Peter Polack, The Last Hot Battle of the Cold War: South Africa vs. Cuba in the Angolan Civil War, Casemate Publishers, 2013, ISBN 1612001955. Šubin, Gennadij V., and Andrei Tokarev, eds. Bush War: The Road to Cuito Cuanavale: Soviet Soldiers' Accounts of the Angolan War. Jacana Media, 2011. Stephen L. Weigert, Angola: a modern military history, 1961-2002. Palgrave Macmillan, 2011. Igor Zhdarkin, We Did Not See It Even in Afghanistan: Memoirs of a Participant of the Angolan War (1986-1988). Moscow: Memories Mockba, 2008. Translated by Tamara Reilly. 399 pp. ISBN 978-5-903116-57-7. Elaine Windrich reviewed the book at h-net.org, A Russian View of the Angolan War, November 2008.